Palo Alto and other government officials have so far been fighting an uphill battle to decrease airplane noise over their cities. For nearly 20 years, Palo Alto officials have been trying to join the San Francisco International Airport Community Roundtable, a group that represents 19 cities within San Mateo County; San Francisco and San Mateo counties; the San Francisco Airport Commission; and The Association of Governments of San Mateo County Airport Land Use Committee. Palo Alto officials pushed to join the roundtable and become voting members in 1997 but were rejected. Mayor Nancy Shepherd attended the roundtable's June 4, 2014, meeting and again requested the city be allowed to join. The city was again rejected. A July 22 subcommittee meeting that included the Airport Land Use Committee, cities of Pacifica, Redwood City, Portola Valley, SFO Airport Director John Martin and the San Francisco Mayor's Office recommended the roundtable not take a vote on including Palo Alto. Doing so would mean that each city would have to take the issue to their voters and then vote as a group to change their bylaws to allow Palo Alto, a cumbersome process. Instead, they recommended the city continue to attend the roundtable meetings to voice its concerns and participate on a regional level through the Association of Bay Area Government's Regional Airport Planning Committee. But that committee has been largely ineffective, the subcommittee noted, having canceled its last meetings in April and July. It has not met since October 2013, and the last year it met regularly was in 2011. The subcommittee also recommended helping Palo Alto and Santa Clara County create their own roundtable organization to focus on aircraft noise "from general aviation or commercial activity in the county or from the region's other airports." "They are the only county with a major commercial service airport in the Bay Area that does not have an airport-focused noise organization with elected officials and appointed staff," the subcommittee noted, referencing Norman Y. Mineta San Jose International Airport. Shepherd was philosophical about the snubbing. "I threw them the whole kitchen sink," she said, noting that Palo Alto has fought battles for other cities because it has a full legal staff and should receive support on the airplane issue. But she noted the SFO Roundtable might not be the best avenue for redress anyway. A June 2011 San Mateo County grand jury report found the roundtable's effectiveness in representing residents impacted by aircraft noise and vibration was largely ineffective and was diminishing. "County officials need to make noise about aircraft noise," the grand jury titled its report. The grand jury found that the roundtable's bylaws do not require the chair or vice chair be an elected representative of a member city, nor does it allow for any membership or committee representation by individual members of the community. The grand jury also recommended that severely impacted cities form citizen advisory groups to work with their appointed representative on the roundtable to identify and reduce aircraft noise. And "neither County of San Mateo nor the San Francisco Airport Commission exercise their authority to issue fines and sanctions for noise violations despite frequent and repetitive failures to comply with standards," the grand jury noted. Shepherd said she is now looking for a more strategic approach, "rather than demanding to be part of the noise roundtable and get no advocacy from them." She will ask for the City Council's Policy and Services Committee to look into how to best define the problem and which agencies to approach. "All of this is good timing, since we're going to have to come up with a new mechanism with our own airport," she said, now that the city has taken over ownership of the Palo Alto Municipal Airport. Airport Manager Andrew Swanson said the city is only in the beginning stages of figuring out what the future Palo Alto Airport will look like -- whether to bring in outside management, for example. Flights are up this year, hovering around 180,000, he said. Palo Alto Airport uses noise-abatement procedures developed by Santa Clara County, with most takeoffs making a turn out over the San Francisco Bay. When there is a fog bank, flights are routed around the municipal golf course and U.S. Highway 101, which does create more noise over Palo Alto and East Palo Alto, he said. Swanson, who worked with SFO on noise and air-traffic trends, said that with the good economy, residents can expect air-traffic increases. "It seems to correlate with the economy. There's definitely a direct relationship," he said. Airplane noise has become an issue throughout the country, particularly as the FAA's NextGen satellite-control upgrades have rolled out, which many residents say has exacerbated the problem. On Oct. 3, Congresswoman Anna Eshoo announced her membership in the Congressional Quiet Skies Caucus. The caucus will raise awareness of the issue and will work to find meaningful solutions to the problem, a spokesperson said. The caucus consists of members of Congress from across the country whose constituents are adversely affected by incidents of airplane and helicopter noise. In September, Eshoo and 25 members of Congress indicated their disappointment with the FAA's handling of aircraft noise and failure to update a decades-old noise limit. "Airports are epicenters of economic growth, but the noise from aircraft can make them pesky neighbors for many residents who live near them, including many of my constituents. The creation of the Quiet Skies Caucus provides a forum to advance solutions that abate aircraft noise in our communities," she said in a statement. Before anyone is going to take Palo Alto's, or any residential community's, complaints about noise seriously, those communities are going to have to document the problems that they are complaining about--in a realistic, and intelligent way. That means: 1) documenting the number of flights over their communities, 2) documenting the actual noise levels attributed to airplanes, 3) determining the number of actual FAA height violations of aircraft operating in their airspace. Even though these suggestions have been made to the Palo Alto City Council for a long time—it’s hard to find any evidence in the public record that the Council has responded to, or even considered, residents complaints about the Palo Alto Airport seriously. From time-to-time they have made some sort of effort to deal with the FAA, but Federal law pretty much gives the FAA trump power for each and every situation that local governments have tried to impose on airports to make them more “resident friendly”. Noise has been one of the most frequent complaints about airports that end up too close to residential housing. Unless the Palo Alto City government admits it has a clear responsibility to the residents to document all of the problems in a way that ultimately can be presented to regional/state/federal agencies—this is more political theater on the Council’s part. "Airport Manager Andrew Swanson said the city is only in the beginning stages of figuring out what the future Palo Alto Airport will look like "
Sounds like an opportunity, who is setting the vision for the airport? How do the regulations impact the "figuring out" process? Is it like a color by number sort of situation, or does the CIty have a say? The major complaint by some posters is that we have not documented the level of noise. If you look at the San Jose Mineta Flight Tracker it shows where the noise monitors are and is continually recording the changes in noise level. The SFO Flight Tracker does not show the noise monitor locations or noise levels as thry change. We need an official noise tracker at the PAO location where there is a FAA office. All things considered - the fact that we have proven that there is substantial number of flights over the area should require an investment of a noise monitor. I feel like we are being "gamed" here and the city should not put up with this. Resident1: You are quite correct, we need objective data. The Portola Valley group hired a private sound consultant who found a number of noise exceedances west in PV. Apparently a Palo Alto noise monitor was part of the arrangement Congresswoman Eshoo and Mayor Fazzino made with SFO in 2000 but obviously it never happened. I believe the Sky Posse will be interested in gathering objective data. By the way, most European regulatory agencies and the World Health Organization regard 55 dBA as the cutoff for acceptable sound levels. The FAA is one of the few agencies that accepts 65 dBA as the cutoff. British researchers were able to show significant increases in heart disease prevalence near Heathrow where the sound levels were 60 - 63 dBA. How difficult can it be to get a noise monitor? This is the strangest thing - you'd think we were in a third world country. The manager of the PAO and the City Manager should be requesting a noise monitor for the airport as part of the upgrades. Everyone at this point recognizes that is a top point of discussion for the many streams we have had on this topic. It benefits the PAO in that they can use an outside source to help manage the quality of performance at the airport - we run a top flight show - and add validity to the noise control issues at SFO - San Jose. Residents of Palo Alto and neighboring communities are invited to join this gathering on Come meet other concerned residents, share specific concerns about the increasing noise from aircraft, get an update on the current situation, and learn how our working group (Web Link) is trying to find solutions. Please let us know if you plan on joining us. If the group grows larger than expected, we’ll be able to contact you if we move to a larger space. RSVP to info@skypossepaloalto.org. Thank you. As bad as the noise level is in many PA neighborhoods, it is nowhere near as bad as in the Rose Garden neighborhood of San Jose. Or downtown San Jose. It is truly ear-shattering there, and it shakes the houses and awakens nearly ALL the residents at night for the last five years. Downtown San Jose usually gets just the landing traffic. Imagine the north end where every day is filled with full-thrust take-offs. Pastures and open space have been carpeted with dense housing over the last two decades, and now they've built Levi's Stadium precisely on the extended center-line. Jets reach the stadium 45 seconds after leaving the ground. Throw in ride noise and fireworks from Great America, and Union Pacific heavy freights up Lafayette Street at all hours -- it's a wonder people who live there don't just curl up and evaporate. Now that we have gone through the PACC voting contest and general elections hopefully we can proceed with the upgrade of the PAO airport and SFO / SJX Noise abatement program with a noise monitor. My feeling is that efforts got stalled by PACC members who envisioned a win as their next political stepping stone and need to work the higher political gains to the disadvantage of the residents. With all of the changes on the state, country and peninsula in general we have a good opportunity to turn this to our advantage. We want the most modern and up-to-date PAO airport which also houses some FAA personnel. All things considered we deserve the best small airport and if anyone is dragging their feet then call them on it. This is about us - the residents. More on the above - Facebook is building in Menlo Park on HWY 84 before you get to the Dumbarton Bridge. Given the number of personnel located in that geographic location - which is at the proximity of the north end of the PAO airport rotation point then we can possibly leverage that to our advantage and get some assistance in the upgrading of the technical performance at the PAO. We want the most current technical tools available to assist in the smooth running of the airport. If we can produce a 5 star small airport then we have better negotiating ability for our other efforts in noise abatement and safety / security at the PAO. We want the PAO to stand out and be a example of the best. Let's get noise monitors at the Palo Alto airport that provide publicly-available online reporting and that alert staff in real-time that a noise violation is occurring, and let's institute fines, not just warnings, for noise violations. According to haywardairportnoise.org, Hayward airport has 4 noise monitors and will fine noise violators. Unfortunately, however, it looks like the system is complaint-driven. Hal - thank you for the info. That answers the question about Surf Air - it cannot operate out of Hayward based on noise levels. However Surf Air is initiating operation out of Oakland Airport this week. I think that what we want for the PAO is a system that originates the complaint automatically and immediately so that the pilot in the air is notified and can change up where they are flying. Possibly too low and needs to realign activity. Also notification that their plane needs to be compliant with local requirements. Upgrade of parts, newer parts, etc. We want the best airport for all concerned - pilots and city residents - and can point to the PAO as a leader in airport management. Since there is an FAA office at PAO they should be on board with a noise monitor - maybe we can get one from Hayward if they have four. The city needs to prove that it can operate a top class airport that is financially sound and exceeds all requirements of a top level airport. That is our best negotiating position going forward for all of the noise abatement issues we have - we need to be a creditable source of data to back up our concerns. I think the majority of pilots flying out of PAO are very responsible and aware of how they fit into the overall sky space which is extremely busy, especially in inclement weather conditions, wind, and winter when it gets dark earlier. They all should be aware of rogue pilots who are acting out irresponsible activity and creating disturbances since it reflects on all of the pilots and brings negative publicity to the airport. Hopefully the pilot organizations are advising their members that they want all of the pilots to cooperate with the airport guidance and regulations so that no unfavorable attention is directed to the PAO. The makes future funding more difficult to obtain. The last thing any one wants is negative publicity that creates more hurdles to running a top flight airport. @res1, how do you conclude that Surf Air exceeds Hayward's 98 dBA noise limit? measured at a standard distance not equal to Hayward's monitor locations. The comparison is not straightforward, but I believe the aircraft is compliant. Looks like San Carlos was set to get a portable noise monitor to share with Belmont back in 2006, paid for with a federal grant. I wonder what happened with that? If San Carlos was able to get a noise monitor with a federal grant, how about Palo Alto doing the same? San Carlos residents with complaints about the roar of airplanes taking off and landing will soon have the equipment to bolster grievances made with area airports, especially San Francisco International Airport. The majority of monitoring of SFO’s noise is in San Francisco and the outlying communities, leaving others on the Peninsula unable to back up grumbling about disturbances or exactly pinpoint the source. On Monday, the San Carlos City Council is set to learn more about the permanent portable noise monitor device the city will share with Belmont. The monitor, which Grocott said resembles a cell phone unit on a tripod, will come to the city twice a year for three-month stints. It will likely be placed at the water district because it is in the hills, near the border of Belmont and San Carlos. Federal grants fully fund the noise monitor which has been in the works for about two years, Grocott said. Pegasus, thank you for posting the link to the petition to reduce aircraft noise in Palo Alto and communities nearby that are affected. It looks like a lot of people have signed in such a short time!!!! @Pegasus, curious why 2000 is the number of supporters needed. @Hal, curious about a suggested location to set up a portable noise monitor. The petition site probably offers a choice of goals, 1000, or 2000 supporters. I would hope the same scrutiny of the numbers of supporters would be given to the number of noise monitors in Palo Alto. For suggested locations for noise monitoring - I would move them between schools. Start with Gunn, then Paly, then Jordan to the Elementary schools. We set the goal at 2000 signatures because it has to be set somewhere. Speaking of counting, I counted the planes over my house tonight between 10:00 and 10:30 PM, and I tracked them on the San Jose airport airline tracker. Within 5 blocks of my house, we had 7 commercial jets within 30 minutes. That is one every 4 1/3 minutes approximately on average. Half of them were within a couple of blocks from my house. They were all flying under 5000 feet. Three planes were SFO bound, the lowest at 4,200 feet, the highest at 4,900 feet per the tracker. Four were SJC bound jets, three of them flying at 2000-2100 feet, and one at 3000 feet. Why are the SJC bound flights flying so low? Well, it is because they are dodging under the SFO bound flights. It is that crazy!! The result is an overwhelmingly noisy environment. It is relentless. It is also rather typical of the kind of traffic we get in our neighborhood a very large portion of the time between 6:00 AM and midnight, daily. There are also loud flights at the other hours, only not so many. Our quality of life is badly impacted by this. How could it not be under the circumstances? Please, consider signing the petition I referenced above if, like me, you find airplane noise to be excessive in Palo Alto. I completely agree with you. I'm under the Big Sur and menlo intersection flight path and it's unbearable with planes flying over my home every 3-4 minutes during the day and night and most of the planes flying well below 5,000 feet. The lowest plane yesterday was 3,600 feet. Can you start a new thread for this petition. This thread is old and many don't read it anymore. I'm interested in knowing why you think a petition needs a thread? Do you mean to advertise it, or to have a discussion about it? Discussing the issues is best done on the basis of the articles written here. And given the naysayers and agnostics about airplane noise pollution, it would not be fair to the people who care about this issue to have to yet defend on these threads a petition for elected officials to take up the issue. But it's a good idea to advertise the petition here, and any further than a mention in related threads, it may be a good idea to actually buy some advertising. Last night between 10 - 10:30pm 19 planes flew over Palo Alto as low as 2,000 feet and Menlo Park, Atherton, and Redwood City had a quiet night. We got them all loud and clear. San Jose planes were at the lowest levels with SFO planes above them. This is a disproportionate burden on Palo Alto. It is disgusting that SFO, which is a for-profit corporation owned and operated by the City of San Francisco, is using Palo Alto as a toxic waste dump. Noise, jet exhaust, and the strong electromagnetic fields emitted by these low flying commercial aircraft are all forms of pollution. Pollution doesn't just effect "quality of life", it effects life itself. If you are tired of SFO using Palo Alto as a toxic waste dump, take a few minutes and sign the Sky Posse petition. Ahh but the Community Airport Roundtable will not admit Palo Alto to membership. By the time the low altitude approach traffic crosses the San Mateo/Santa Clara borderline, it is over the Bay for final approach. Wow, "Vacuum Cleaner Charlie" launched a full scale assault on Palo Alto along the Big Sur route from the south about an hour ago... guess SFO is going back into its normal flow pattern, as the westerly winds return. Tonight there was an etch a sketch show over downtown Palo Alto too. Planes going in a variety of directions. A small plane going North on Emmerson, a line of plane lights S to NE. Very low - the small one heading N in front of Pizza my Heart looked like it was looking for a parking space, I could have yelled take mine! If you don't think aircraft noise is a laughing matter, take a few minutes to visit the Sky Posse website, and sign their petition to reduce aircraft noise over Palo Alto. I agree, last night was horrible in downtown north. The Big Sur route was in full swing x 100! The loud whining of planes all night long one right after the other. The petition is rolling along. Spread the word!! There are currently three petitions about airplane noise from nearby cities, and these may indeed all be the same problem. Question from musical: "@Hal, curious about a suggested location to set up a portable noise monitor." Placing noise monitors under flight paths would be the logical answer, but we've got numerous flight paths over this area to/from multiple airports. Best locations for monitors? Research necessary. Great information. I experience exactly what you do because we are both under the Big Sur flight path. Your a bit luckier than I because by the time they get to downtown North they are even lower in altitude than over your location. When I do the math, it comes down to a plane flying over every 2-3 minutes with the majority of them flying well below 5,000 feet. It just doesn't matter anymore if you have double paned windows or an insulated roof. You can still hear the high pitched roaring loud and clear. Palo Alto should have more than one automated noise monitoring station, but the single most effective location for a monitoring station would be close to the Menlo IAF (intermediate approach fix), which is near the intersection Willow Road and 101. Most aircraft approaching SFO from the north, west, and south, are being directed to rendezvous over the Menlo IAF to begin final approach to SFO. In the year 2000, Anna Eshoo reach an agreement with the FAA to raise the minimum altitude of flights over Palo Alto from 4,000' to 5,000', and for SFO to install an automated noise monitoring station near the Menlo IAF. The noise monitor was never installed. Regarding monitors, I would suggest a permanent portable monitor that can be placed at different locations as needed, if we cannot have more than one monitor. I also suggest that SJC planes be monitored as well as SFO planes, as they are incredibly loud and actually quite frequent over a large swath of Palo Alto. It really chaps my "hide" that people who really do not care about airplane noise or traffic fall back to the position that everyone has to prove everything. It used to be that no one complained about Palo Alto airplane noise, because there was virtually none of it. The mindset of such people seems to be that there are always insane people in the community that complain about everything, so we should just ignore them. As I said, if there were insane people complaining about Palo Alto airport noise they were hiding themselves pretty we'll until a few years ago. Did these whiners just show up out of nowhere or like my experience was, did they like me start to notice planes going over very low and very loud in the middle of the night? I think so. I think when you hear people complaining consistently over years ... about the last 4-5 now you can guess there is a real problem out there. The idea of saying document is just a stalling tactic. But, it is a reasonable next step, but one that City must take. It is unreasonable to expect you are going to get objective and good results by having people who are awakened from their slumbers to get up, turn on the light, make and entry in their airplane noise notebook and go back to sleep, and you know that. City ... what about, can you get on it and do something proactive and for the residents for a change? Put some noise monitors at the various Fire stations maybe and collect the data on the City site and post it for all to see. When there is noise you can use Siri the iPhone app to find out what plane is overhead, assuming it is a commercial jetliner. There is a bit of a letup in the last months that I have noticed, but really this has to be driven by data and standards, but to just dismiss people because they have no way to document or measure noise is just counterproductive. What's silly is the recurring drumbeat that "some conspiracy has shifted airplane noise to Palo Alto." The simple explanation is that SFO has grown. 352,781 operations 2005 to 387,248 in 2010 and 421,400 in 2013. 2014 is trending up another 3%. There may be no airside solution to increased air traffic. Lobbying congress to demand that ATC "do something" may not get any where. So what do you want to do? Close down SFO? Shift domestic traffic to Oakland and San Jose? Accelerate HSR development to eliminate California commuter flights? Expand Sacramento airport and build an HSR link to the Bay Area? A lot of us have watched the discussion with a certain amount of slack-jawed amazement. Yeah, more flights. No, they don't really bother us. Yes, it's nice that we have good travel options. Closed-door government conspiracies? Your tinfoil hat is crooked again, dear. So go at it. Sign your petitions and demand action! March on SFO. Call the FAA and Anna Eshoo's office. But have some realistic goals or you won't accomplish much. Anonymous - "But have some realistic goals or you won't accomplish much." Here's a realistic goal, fly above 5,000 feet! They've done it before and they can do it again. Conspiracy may be a bit strong, but unless the planes have formed their own swarm some person or group of people have made the decisions that "shifted airplane noise to Palo Alto." There is significantly more disturbance, including noise, over Palo Alto from commercial planes using SFO than almost all cities closer to the airport than Palo Alto. No one has suggested closing SFO. The continued use of this straw man, not even really a straw man, is laughable. The request has always been to keep the planes flying as high as they committed to fly: 5000 feet above Palo Alto. We're 20 miles out from the airport at roughly the same ground level as the airport. 5000 feet should not be difficult to arrange. But the puzzle is, why would someone continue to write on Town Square: "I don't have a problem with airplane disturbance, therefore nobody does, and those who claim to are lying." Or, "These people who are complaining about disturbance are looney; they want to close the airport!" What possible motive is there for this sustained irrational interference with our efforts? It would seem that the only explanation is simply a need to bully. Or is it actually a troll, supporting the effort to reduce disturbance by goading it on? A 2-3% annual crawl in business at SFO is relative. Per the petition and Weekly article 25% overall SFO traffic growth in 15 years, but the traffic over Palo Alto (from SFO) has increased nearly 200%. At altitudes, half of what they used to be. Add to this new services from San Jose (Southwest Airlines), San Carlos (Surf Air), which are growing. If noise does not bother you now, it could someday, and you could get a new service over your head any day too. What is interesting is that the flying public in the airplanes that make the noise (at 2000 feet and below - to save fuel) are commuting here because they are peacefully living somewhere else, and it's more convenient to shuttle back and forth with a consumer experience like Surf Air. It's also not just the noise. It's the toxic waste going into the air, which is know to spread more widely than expected. With 50% or more of SFO arrivals crossing Palo Alto, we may as well be under an airport. The particles in the air do not stay inside a flight path, GPS cannot achieve that miracle. Below is a link to the FAA's website on NextGen and the Northern California Metroplex. The bar graph titled "Northern California Average Daily Metroplex Traffic (FY09–FY13)" confirms that the NorCal Metroplex traffic has been flat for the last five years. Air travel is not a thriving, growing, industry. The only reason SFO has been able to grow at all, is by "stealing" traffic from surrounding airports like Oakland, and San Jose. 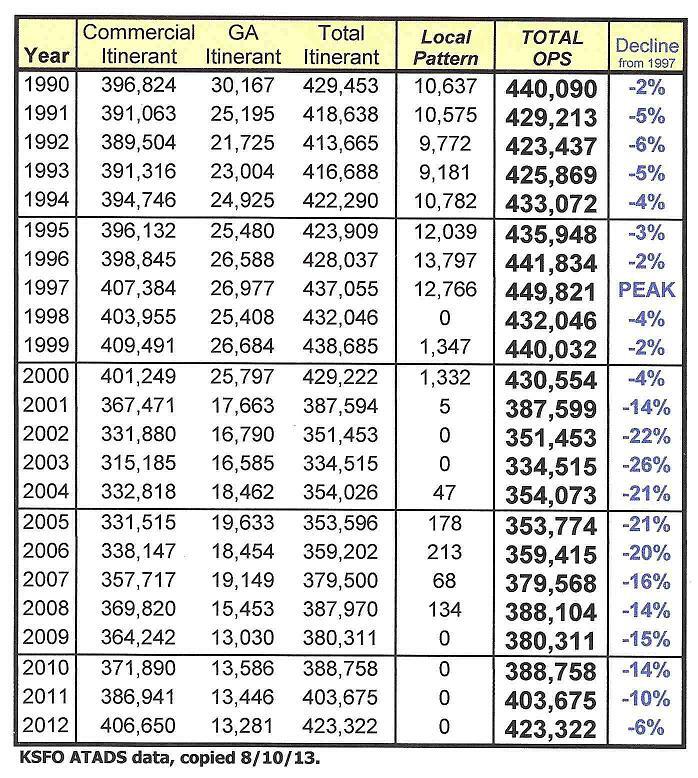 SFO ATADS data shows that total air operations at SFO peaked in 1997, went into decline, and has still not recovered to 1997 levels. SFO's air traffic numbers do not explain the dramatic increase in air traffic, and aircraft noise over Palo Alto. I'll try this one more way then go away. It doesn't take a conspiracy to increase flight traffic over Palo Alto. A 20% increase in air traffic can easily explain how arriving flights get spread out over a larger piece of the Peninsula and substantially increase Palo Alto overflights. Not saying that's what's going on, but it's as likely as a back-room deal. The charted altitudes over Palo Alto haven't changed in decades and frankly aren't likely to change. Anything is possible, but do you think ATC and the airlines will agree to a 10,000 foot arrival "gate" somewhere east of San Jose for SFO? That'll add 10+ minutes of flying time to flights from every direction except the south. That's "only" $1M per day of extra fuel for the airlines. It's something tangible to ask for. As far as "5000 feet shouldn't be hard to arrange": that's true for Santa Clara but not for Palo Alto. San Francisco landing traffic needs to be at 5000 feet at Moffett, 4000 feet at Palo Alto and 2500 feet at San Carlos. Lot of things you can ask for, but a steeper glideslope at an international airport will be a tough one to get. It's not a conspiracy issue or back room deals. And nothing to do with paths. You can have five roads and decide to only use 1. Despite dismal growth in air traffic, Palo Alto has had SFO flights triple here, and they add up to over 50% of all of SFO arriving flights. The opposite of your suggestion that "arriving flights get spread out over a larger piece of the Peninsula." A 50% share for one town is hardly "spread out." The question is also what will happen going forward? Not sure why anyone thinks aircraft on approach to SFO need to be at 4,000' over Palo Alto. In the year 2000 Anna Eshoo reached an agreement with FAA/SFO to maintain a minimum altitude of 5,000' over the Menlo IAF (Willow & 101), and I have on several occasions seen (on webtrak) large 747 sized aircraft fly as high as 6,500' over Palo Alto, and still go on to land successfully at SFO. If there was airplane noise before you bought your house, you are told you knew the airport existed and should not have bought your house if you did not like it so don't complain. If you bought your house and then the airplane noise became a problem you are then told that is progress and don't complain. Who are the ones who do not want to hear complaints about this? Anyone connected to the airlines or airport, or the ones who perversely love to think they are NOT complainers when they only complain about other people who complain, valid or not. It looks to me like a resident from Another Palo Alto Neighborhood is using multiple listings under different names. Same attack scenario but no identification as to their location. Snarky comments - I saw that on one PACC member during the presentation on airplane noise for the PACC. As to Surf Air there are many private jet companies which advertise in the high end magazines and papers using full page ads. They are using actual jet planes. Surf Air is one step down from an actual jet plane so it produces a lot of noise and flies low = thus the complaints on that company. The Bruer & Kjaer Webtrack 5 does show where the noise monitors for the San Jose Airport are and notes the noise levels as they change. It is not obvious where the SFO noise monitors are. We need a noise monitor for the south section - suggest SSL facility on Fabian. Since they are in the space business then it should be obvious to park a noise monitor at that location. Also one at Lockheed Martin in Stanford Research Park to catch the planes as they come down from the hills. Aircraft noise isn't the only noise in Palo Alto. I'd like to see this city install noise monitors that measure noise pollution in the city overall. Looking around with this idea in mind, I found an interesting company that offers "smart city" sensor applications that measure just about anything you'd want measured -- noise and air pollution, parking, structural health, electromagnetic field levels, lighting, roads, water quality, etc. -- there are 50 sensor types. Interesting that this technology is built in Spain, not in Silicon Valley. "Libelium (established in 2006) designs and manufactures hardware for the implementation of wireless sensor networks so that system integrators, engineering and consultancy companies can deliver reliable Smart Cities solutions with minimum time to market. All Libelium’s products are modular, easy to deploy and include extensive documentation and support through a global community of developers. Libelium’s customers range from startups to large international corporations implementing Smart Cities projects in North America, Asia and Europe." I wonder if the city would even consider investing in technology like this? Note: my previous comment is in no way an endorsement of the "smart city" technology company I referred to. I discovered it just this morning during a web search. I would be interested if others on this thread have ideas for noise monitoring that Palo Alto might invest it. None of our surrounding airports or the FAA are going to provide us with monitors because we lie outside of their 65 db CNEL airport noise exposure maps. @Hal -- Palo Alto has a detailed quantitative noise ordinance, municipal code chapter 9.10, so I assume the city or the police do possess sound meters. I may have mentioned that I have an old Extech 407736 meter -- Web Link -- around 300 dollars these days. Airliners overhead an hour ago peaked at 60 dB from my front yard. A passing car registered 62 dB (briefer duration). Ambient noise level is a peaceful 45 dB. No "landscape maintenance" noisemakers yet. Note we have the abnormal weather pattern today and air traffic seems to have disappeared for awhile. @musical - thanks for the measurements. In PA's Noise sections of the Comprehensive Plan Update draft, there's a description of the sound measurements taken with a Larson-Davis Model 820 sound level meter at 18 locations in April 2014, along with a map of the monitoring sites. Short term measurements lasted for 15 minutes each and were taken over 2 days at 16 locations; long term measurements were taken at 2 locations for a single period of 24 hours. There is also detailed sound data collected by these measurements in the appendix of the document. I don't see any indication that Palo Alto maintains year-round noise monitors anywhere in the city. On a related point, the draft of the Comp Plan Update describes noise exposure boundaries for the Palo Alto airport (see last paragraph below). "At the nearest points within city limits, Palo Alto is located approximately 2.6 miles to the west of Moffet Federal Airfield, 6 miles to the southeast of San Carlos Airport,10 miles to the northwest of the San Jose International Airport, 15 miles to the southeast of San Francisco International Airport, and 17 miles to the south of Oakland International Airport. Additional small airports in the vicinity include the Hayward Executive Airport, at 14 miles away, and the Half Moon Bay airport, at 18 miles away. Although Palo Alto does receive some noise from aircraft using these facilities, the Palo Alto city limit does not fall within the airport land use planning areas/airport influence areas, runway protection zones, or the identified noise contours of any airport other than Palo Alto Airport and provides guidance related to the placement of land uses near the Palo Alto Airport. Specifically, the CLUP (Comprehensive Land Use Plan) seeks to protect the public from adverse effects of aircraft noise, to ensure that people and facilities are not concentrated in areas susceptible to aircraft accidents, and to ensure that no structures or activities adversely affect navigable airspace. Based on the noise contours presented in the Palo Alto Airport CLUP, within the City of Palo Alto only airport and golf course land uses fall within the Palo Alto airport’s 60 dBA noise contour." Here's a noise abatement map for the PA airport when it was operated by Santa Clara county. I don't find anything similar from the city of Palo Alto now that the airport is under its purview. Great information. My experience is that the air traffic is in time waves in which there are very busy periods in the morning and evening then less busy periods in the middle of the day. It is like commute traffic. The noise monitors should be working at the high points of the day and evening if they are to be of value. If the above measurements were taken during the mid-afternoon low period then they will not represent the entire picture. Also the SJX traffic is periodic in our location based on wind changes so any one day may not look like the next day. I think the city needs to at least rent some noise monitors for a month to take in the whole picture with it's variations based on weather and time of day. Interesting that Boeing's map of SFO's noise monitors shows a red dot just off Willow Road, near the intersection with 101 (scroll to bottom, see inset, just to the right of #28). This is where a noise monitor was supposed to be installed per Eshoo's year 2000 agreement with FAA/SFO. Why didn't that noise monitor at the MENLO navigation point ever get installed? "Lastly, San Francisco Airport will install a permanent noise monitor near the navigational marker at the border of Palo Alto and Menlo Park that will aid in the enforcement of the new flight procedures." I found a Southwest Chapter of the American Association of Airport Executives airport news list posting in the archives at californiaaviation.org quoting an SF Chronicle story from 1999 about this planned installation. Pretty interesting. I'm quoting in full; apologies for text length. Menlo Park and three other southern San Mateo County cities. other sensors track airplane noise in San Mateo County. is finally willing to look at the effect of noise on their communities. newer airplanes operate more quietly, Wilson said. produce an average decibel level. Currently, it is not clear whether the problem is one of fact or perception. improve safety and reduce noise. thundering overhead between 4:30 a.m. and 6 a.m, to no avail. To save fuel and time, planes are now purposely flying lower (noisier), and due to pilot errors as well (safety issues). The Asiana crash has all flights on training wheels way down low over Palo Alto, into SFO. I'm surprised we are not asked to provide refreshments along the way. "Note we have the abnormal weather pattern today and air traffic seems to have disappeared for awhile." That was yesterday, they are up there today. You can hear the grumble in a pattern that is not the storm - it's the airplanes. Sadly the same sounds that are heard on sunny days too. Data on flight times, aircraft type, altitude and path can all be obtained from the radar services. For any given location on the ground, the noise from each event should be predictable and repeatable, with minor adjustment perhaps due to temperature and humidity. Seems to me that an array of 24/7 noise monitors is unnecessary to push the case of regulatory relief from commercial air traffic noise. Someone earlier said the FAA uses modeled data for their noise assessments. Noise monitors may just end up as an expensive red herring. The real arguments are about what constitutes a reasonable noise burden in terms of both average levels and transient peak levels. And then it gets into spectral content, whether it's a roar or a whine or fingernails on the chalkboard. Noise monitors have their place near runways on the take-off and approach ends because sound levels are much louder and more variable, dependent on changes in power levels and descent or climb profiles, in conjunction with specific noise abatement recommendations. You'll see monitor numbers reach 90 dB on some San Jose take-offs. I see where a local noise monitor could be useful in East Palo Alto. Hal's link to the Noise chapter of the Comp Plan Update was illuminating to me. The 16 short-term monitoring exercises show ambient daytime levels from 53 dB residential to 73 dB at Alma and Seale (15-minute averages). The 24-hour test at East Meadow Circle, within earshot of 101, bottomed out at 44 dB after midnite. I've measured as low as 34 dB in my neighborhood, near the limit of my meter's sensitivity. Why use noise models when you can get actual noise measurements? You mean that the cost of building noise models is less than a couple of noise monitors? I would think it's the other way around. Or does the FAA use the same model report for any location. I'm out of my depth here, but you can look up FAA Integrated Noise Model and see that plenty of work has gone into this. The key players already know how much noise we're getting, and how it changes with altitude. Sky Posse's petition (I am not a member) appears to seek remedy by spreading out the commercial flight paths and keeping altitudes over Palo Alto above 5000 feet. Looks reasonable to me, for a standard 3 degree glidepath into SFO. Woodside wants to see altitudes above 8000 feet over Skyline (elevation 2400 ft). With half the commercial flights presently coming across below 6000, they say an expert measured 80 dB up there 61 times over a two week period. Descending from 8000 over Skyline to 5000 over Palo Alto in 2 minutes is a bit more aggressive than 3 degrees but shouldn't be a problem. Thanks for quoting this article. To me, one of its most interesting parts is the complaints statistics. Compare the numbers quoted and the current level of complaints from the same communities, and you may be very surprised. Guess why they have gone down so much in those towns? I have my guess on this. I think we need a new APP - one that monitors noise level. Siri can already tell you what plane is over your head so the next step is how loud is it. We need to ask Google to look into that. If money is spent on noise monitoring, it should be paid to an unbiased independent contractor. Requesting noise monitors from SFO's noise abatement office (NAO) would appear to be counterproductive. *Reached an agreement with SFO’s Noise Abatement Office (NAO) to install noise monitors at the Woodside VOR and in Portola Valley and report the results after a four-month period. Mr. Lyons reported that between March 6, 2012 and July 8,2012, the NAO took aircraft noise measurements at two locations – the Woodside VOR and near Portola Road and Westridge Drive in Portola Valley. The NAO’s technical report, issued on June 27, 2012, concluded that noise levels were well below state and federal standards. The NAO calculated average noise level on the basis of the CNEL (Community Noise Equivalent Level)—a 24-hour average of all aircraft noise above a certain threshold—and said that the SFO monthly aircraft CNEL ranged from 32.5 to 36.2 decibels (dB) for Portola Valley. He noted that 35 dB equates to the noise level in a library reading room. *The report data are incomplete. During the four-month period, according to SFO records, a total of 8,135 flights crossed the Woodside VOR on the path over Portola Valley to SFO and OAK, but the NAO’s Portola Valley sound monitor recorded only 1,095 flights. The NAO acknowledged that its sound equipment failed to record about three of four flights at altitudes up to 5,500 feet over the VOR. *The Portola Valley noise monitor, set seven feet up from the ground, did not conform to California Division of Aeronautics noise standards for setup (Section 5072). The standard required placing the measurement microphone 20 feet above ground. *The monitor should have been set to record all aircraft noise greater than 55 dB, but its calibration ignored all flights generating less than 60 dB. Further, NAO’s calculation of average noise was 0 dB for any flight generating noise of 59 dB or less. Flights calculated at 0 dB would cut the average noise level substantially. *Some findings in the report are so irrational they can’t possibly be correct. For instance, the NAO reported finding 13 days with SFO aircraft recording 0 dB CNEL in Portola Valley. That’s the threshold of human hearing, Mr. Lyons pointed out, about four times quieter than the sound of a pin dropping. Other SFO data on those same days shows scores of flights, many lower than 6,000 feet, over the Woodside VOR. On April 7,2012, June 8, 2012 and July 6, 2012, for instance, NAO reported CNEL reading of 0 dB for Portola Valley – day that 51, 70 and 60 flights, respectively, flew over the Woodside VOR. The NAO calculated an ambient noise level range of 50.4 to 62 dB in Portola Valley – what might be expected in downtown San Francisco during rush hour, which would be about eight times louder than a quiet rural area. The ambient noise level in Portola Valley, Mr. Lyons said, would be 30 to 35 dB. "He noted that 35 dB equates to the noise level in a library reading room." I have been hiking in Portola Valley and unfortunately they have the same problems that we have here. You can see and hear the low flying planes, and they do not sound like a library reading room! This is a clear example of how ridiculous 24-hour average measurements are. We don't hike or live on an average of 24 hour noise. You go to a rural area for some peace, and you get your blood pressure spiked unnecessarily. It seems like nothing is off limits for commercial air traffic, or for the organizations that manage it. I was at Vasona Park in Los Gatos on the Los Gatos Trail around the lake when a plane came over head that was unbelievably low. I had to groan - not them too. There is no where to go now that planes are not hunkering down to prepare for landing. I think the discussion about noise monitors and about dB levels, etc. is somewhat counterproductive to the purpose of reducing disturbances caused by aircraft overflights in Palo Alto. Having 55dB or 45dB noise levels from aircraft flying overhead rather than 65dB noise levels, while a welcome change, will still leave us suffering from hundreds of disturbances every day. The real issue - as vividly illustrated by the skyposse charts - is that the bulk of the air traffic crossing the Peninsula bound to SFO crosses over Palo Alto instead of being spread out among other cities on the Peninsula. Making marginal changes in the noise level for each plane without doing something about the sheer number of planes flying overhead will still leave PA with a disproportionate burden of noise from SFO bound flights as well as with the combustion byproducts of jet engine exhaust to contend with. I don't think those of us concerned with the problems of jet overflight in Palo Alto should get side-tracked by the red herring of dB levels. The real issue is the volume of air traffic and why virtually all the Peninsula overfllight traffic is routed over Palo Alto. THere needs to be a more equitable sharing of the burden of this traffic. That is the real issue. I agree with Hal. SFO is not trustworthy. They will skew whatever they need to, to make us believe there is no problem with plane noise. Even the SFO representative who attended our local city council meeting was on the defensive with questions from our council regarding plane noise. He very well knows there is an issue here in Palo Alto with plane noise, but needs to make it appear as though there is no problem. My opinion is that SFO is positioning themselves because they are seeing that Palo Alto is finally noticing a problem and is asking questions as to why this is occurring over our city. SFO was hoping that we would never notice the noise abuse, but we finally have. Since the airplanes can't skip the communities closest to us, the problems are the same or worse for nearby communities. It used to be that the concept of disproportional traffic meant something. The NextGen procedures to rationalize airspace actually rest on on disproportionally impacting less people, and thereby reducing noise for the majority. At this time, thousands in the mid-Peninsula are the "fewer people." This may not have been intentional, and it certainly sounds different in the news. Over Thanksgiving, Michael Huerta announced the planned changes will reduce travel delays. The way the FAA measure noise is how the argument is being made that it's not a problem to disproportionally have more traffic, and as long as they say it's at the levels of a reading room library, we may need to have the decibel debate. SFO is not trustworthy, but their behavior is quite are predictable, if you remember that SFO is a for-profit corporation owned and operated by the City and County of San Francisco... a city with some serious budgetary problems. From Hal's post above we see that people have been complaining about the loud 4:30am UAL flight from Hawaii for decades, but nothing ever changes. Why?.. because SF collects a landing fee every time UAL396 lands, and an airport tax from every passenger, they probably get a piece of the fuel concession, and all of the concessions in the terminal selling overpriced food, the SF taxi drivers all have to buy a medallion from SF, and all of the shuttle buses probably pay some kind of fee to service the airport. Some of the passengers stay at SF hotels, and pay a hotel tax, and they buy tee shirts at Fisherman's Wharf. San Francisco is a city that knows how to operate a tourist trap. SFO is a hub. The flights from the three Hawaiian airports may have people going on to other locations. These planes have to meet a schedule so many passengers can transition on to other flights. If the people miss their flights then SFO may have to put them up for a night. Not to defend anyone, it's not just SFO. All have commercial and private travel, probably more responsible for the noisy lowest flying airplanes. I find it odd that much work is done to get people into pubic transportation, housing near transit, when executives are commuting within the Peninsula in private air transportation. They are negatively affecting people's quality of life so they need to be willing to acknowledge that and work collaboratively to make positive changes for the residents below their flight paths, even if that means losing some profit. Sherry, Jetman, who wrote, all point out that profits drive the aviation industry and we on the ground under the air traffic bear the noise burden. I might add that everyone/thing on the globe bears aviation's carbon emissions burden. Aviation's noise pollution burden is NOT economically accounted for in the FAA and industry calculations. And the current "optimization" of U.S. airspace by the FAA, aka "NextGen", uses the environmentally-friendly sounding rationale of "reducing fuel and noise emissions" to spin what is, in fact, the economically-driven aim of increasing U.S. aviation capacity. Yes, flight procedures that reduce fuel consumption reduce carbon emissions, and condensing flight paths reduces noise impacts over total numbers of people effected, but the reason these procedures are being instituted in the first place is economic and the economic model doesn't account for pollution's costs. As who wrote correctly points out: "The NextGen procedures to rationalize airspace actually rest on on disproportionally impacting less people, and thereby reducing noise for the majority. At this time, thousands in the mid-Peninsula are the "fewer people." The FAA calls this calculation the "Net Noise Reduction Method". One of the more fascinating documents on the subject of how the FAA calculates the impacts of noise burden is the NextGen Advisory Committee's "CatEx 2: Recommendation for Implementing the Categorical Exclusion in Section 213(c)(2) of the FAA Modernization and Reform Act of 2012" from June 2013. "Any navigation performance or other performance based navigation procedure developed, certified, published, or implemented that, in the determination of the Administrator, would result in measurable reductions in fuel consumption, carbon dioxide emissions, and noise, on a per flight basis, as compared to aircraft operations that follow existing instrument flight rules procedures in the same airspace, shall be presumed to have no significant affect on the quality of the human environment and the Administrator shall issue and file a categorical exclusion for the new procedure." In particular, the FAA reference to the NAC called for guidance on how “measurable reductions” in noise from performance-based navigation (PBN) procedures “on a per flight basis” might be assessed consistent with the legislative language, given that FAA typically uses methods that aggregate noise, which take into account the noise exposure of people on the ground from aircraft flights in the vicinity over an average daily period. FAA had undertaken an initial assessment on how its noise assessment methods might be used to implement Section 213(c)(2), but had not been able to reconcile its traditional methods of noise analysis with the apparent requirement from Section 213(c)(2) that noise reductions be assessed per flight. Greener Skies over Seattle Environmental Assessment: The CatEx 2 Task Group recognized that often more than one change in procedures is proposed for air traffic actions and that most procedure changes would affect an entire airspace, necessitating evaluation of procedures in combination. As means of considering how the Net Noise Reduction Method might apply in such a situation, the CatEx2 Task Group reviewed the recently completed Seattle Greener Skies EA,which addressed a number of air traffic actions, including two new Standard Terminal Arrivals (STARS) and 24 new Required Navigational Performance (RNP) procedures, all with Optimized Profile Descents. The noise analysis was re-evaluated with the Net Noise Reduction Method and showed that there would be an estimated 132,484 people for whom noise levels (DNL) would increase with the proposed changes, and an estimated 311,122 people for whom noise levels would decrease, for a Net Noise Reduction of 178,638. End of quotes. See the table on page 12 of the document for a good visual summary of how the math works. SO, why are noise monitors useful? Demanding that our elected leaders provide our cities with noise monitors is a clear message to legislators and industry that we care, as citizens, about noise pollution. That it is NOT OK with us. In order to finally get past the oft-repeated dismissal of noise pollution's effects as purely subjective and therefore unworthy of regulation or social and economic valuation, we have to demand that it is measured and accounted for, like air and water pollution. Two commenters in the The Almanac's "town Square" are reporting that Phoenix is suffering from the ill-effects of the FAA's "NextGen" roll-out at PHX. "Locals sue FAA over aircraft noise"
From Phoenix... the dramatic increase in aircraft noise, brought about by the FAA's new NextGen flight paths, made national news with a four minute segment on CBS This Morning. "FAA's new flight paths spark noise complaints"
This just isn't a problem. Yes, you can occasionally hear a jet overhead. So what. You also hear cars going by on the road. The routes that the jets flow should not be dictated by a few people on the ground making the same complaint over and over. Did you even watch the video? The flight paths are not being dictated by a few people on the ground, they are being dictated by the FAA. When the NextGen flight paths are implemented the noise is not occasional, it is non-stop, with a noisy plane flying over every 30-60 seconds. Jetman - thank you for the news link. Its nice to hear that the noise concerns are reaching a higher platform. I'm awaken late at night and early morning everyday by jets flying into SFO via the West approach. It has really affected my families quality of life. I guess nobody went to the Policy & Services Committee hearing at City Hall on Tuesday evening.